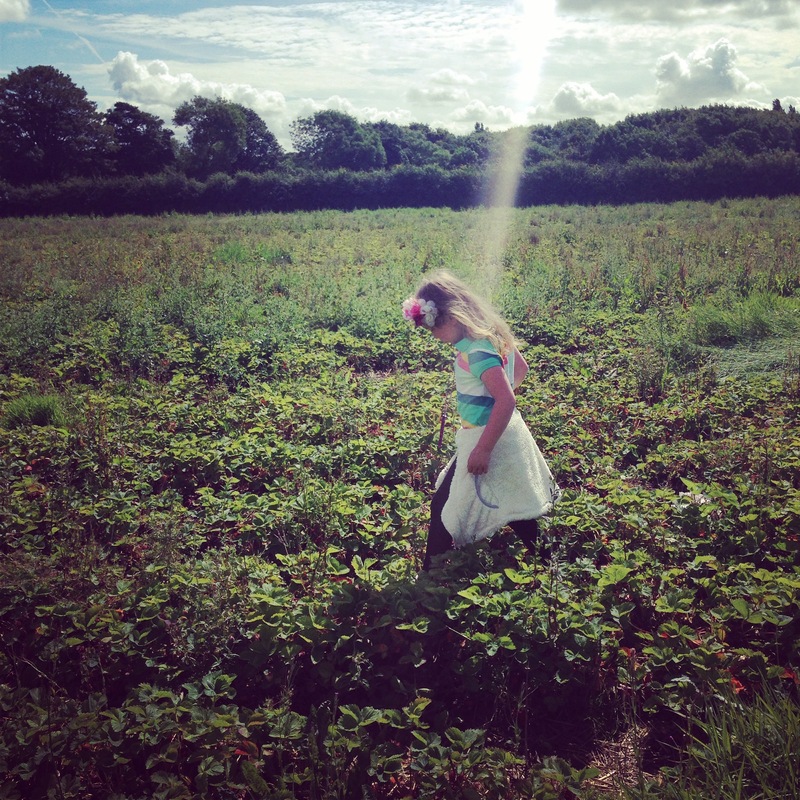 Wanting to relive one of my favourite childhood things to do, I recently took the munchkin fruit picking. Mr C was on a jolly boys outing to Edinburgh so I roped in invited my mum and dad, I still was unable to drive at the time, they brought along my nephew for the ride. We went to Kenyon Hall Farm in Warrington, which is just a junction or 2 up the M6 from where we live. Kenyon Hall Farm is a lovely place to visit with a farm shop, cafe and childrens play area, as well as lots of different things you can pick for yourself and plants and herbs you can buy! There’s a strong possibility I was more excited than the munchkin. Still recovering from my section I was unable to bend so I set the kids to work, looking for and picking the biggest looking strawberries they could find. We also picked blackberries, raspberries and gooesberries. It was a lovely warm, sunny day after a week of rain so I stood enjoying the fresh air and making sure the froglet, who slept the whole time, stayed in the shade. The farm is flat with plenty of walk ways so it was really family of all ages friendly and was easy to get the pram around. The munchkin couldn’t understand why she was picking strawberries when she didn’t like them and going on to pick raspberries and then gooseberries was a step too far and a sulky face started to arrive. I mean if you’re 6 once you’ve picked one fruit, you’ve picked them all! It was a lovely way to spend the morning getting plenty of fresh air and being outside. I would really recommend it if your kids haven’t experienced it, they get to see 1st hand where their fruit comes from, it’s a free activity, you just pay for what you pick. There’s not much more I can tell you about fruit picking, so I’ll just share with you some pictures. If you want to know what’s fat and gooey you should definitely have a watch of the little video!